Today I planned to deep clean my pantry – wipe down the shelves check for anything that needed to be discarded, wipe the outside of all of the storage jars and lids and generally make sure everything was in working order. I had removed the contents of one shelf, cleaned about half of them, discarded empty oil bottles and an empty bottle from apple cider vinegar when the phone rang. It was my daughter and she suggested that she come to visit and we could sort out the photos of the grandchildren that she and I have on various digital devices – computer, laptops, and phones. So, the pantry actually looks worse than when I started. Although I have not finished sorting all of the photos of Miss O and Izz, I am well underway. Apart from the 3 empty bottles from the pantry, I have also manged to declutter 2 large lidded boxes that were in the cupboard in the guest room. I had kept them from when I acquired them at work a few years ago. My intention was to cover them with contact to make memory boxes for Miss O and Izz to store the schoolwork that they wanted to keep. My daughter happily took them to finish the project and hopefully the girls will appreciate having a designated space to keep their work. One thing leads to another and I found 2 large block mounted posters – of an echidna and a wombat which we have owned since our daughters were at primary school and I intended to hand them on to the grandchildren. However, my daughter pointed out that she simply does not have the space for them so we decided that she is going to offer them to the class teachers at school. The pictures are still in the cupboard at the moment but may be on their way to a new home before too long. Here are a few photos that we enjoyed ‘finding’ as we sorted them out. It could be next weekend before I get back to the pantry but that can wait. We arrived home early this morning after an overnight flight from Singapore. I had pretty well cleared out the refrigerator before we left and shopping was the last thing on my mind this morning. The house-sitters had bought fresh milk for us and GMan made a loaf of bread. This afternoon I began to think about what we might have for dinner and I really was not in the right frame of mind to go grocery shopping shopping so I decided to make do with what we had on hand. There were sausages in the freezer as well as some pre-cooked rice and diced raw onion. I grilled the sausages and then sliced them up. Next, I fried the onion in the pan, added 1/4 teaspoon of chilli powder, sliced celery (from the garden) and a broccoli stalk which was also lurking in the freezer. A can of tomatoes and 5 olives which was all that was left from a jar in the frig completed the sauce. 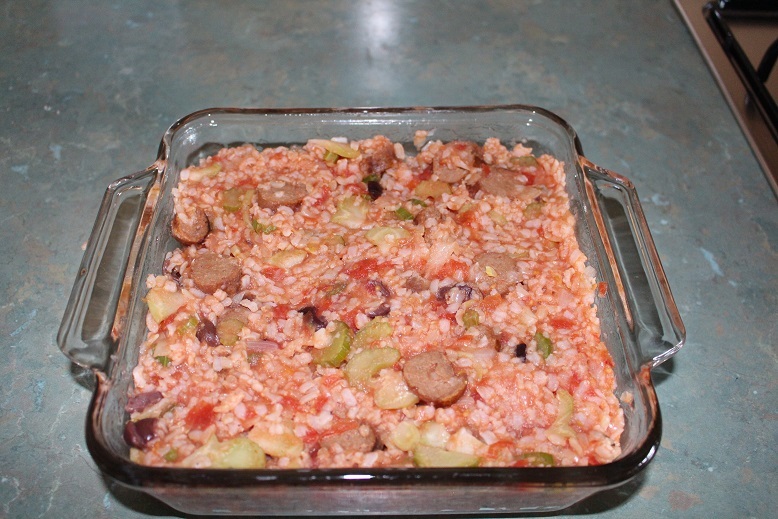 I added the thawed rice and sliced sausages and heated the mixture before putting it in a Pyrex dish. 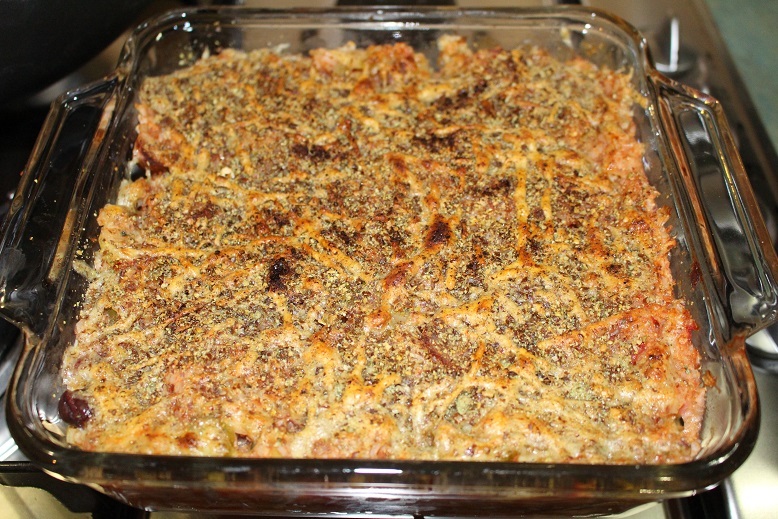 I topped it with a mixture of grated cheddar and parmesan cheese mixed with flaxseed meal and ground pepitas and popped it under the grill for a few minutes. Since we had not bought any fruit and vegetables today, I served it with a generous helping of kale from the garden which I chopped and stir-fried with a sprinkle of chilli powder and squeeze of lime juice. GMan and I ate one half of this tonight and the other half has been divided into 3 serves for my lunches this week. Even though I have consistently decluttered for several years there are always random things that elude several attempts. 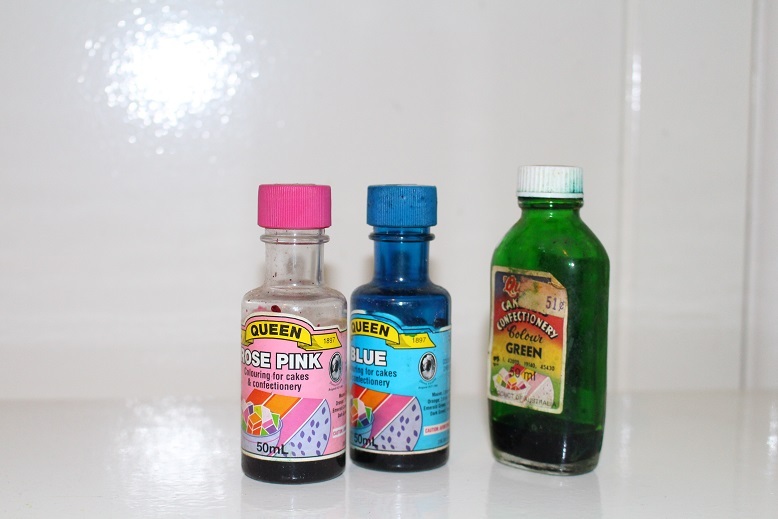 These 3 little bottles of food colouring were in my pantry until tonight. I have overlooked them each time I have cleaned out my pantry. Tonight I opened the wire drawer to get out black pepper to season our dinner and saw these bottles of food colouring with fresh eyes. I do not use it in any baking and it is a long time since I have made play dough or anything else that I may wish to colour so they went straight in the bin. The fact that all of the “ingredients” are numbers made me even more certain that there is no way that I would ever use them again. What have you decluttered lately? Anything that should have been binned a long time previously?